For the last 11 weeks of my life one of the challenges of the day is just getting a shower. I remember when I would take long leisurly showers that made me so relaxed I would feel like a new woman. I didn't realize at the time how much of a gift that was. A shower is something to be grateful for. It still is one of the highlights of my day it just looks a little differently then it used to. Now it has a monitor attached and usually ends abruptly with a baby crying in need. Oh well it still is a little relaxing and I have learned to not take such a great relaxing thing for granted. Over the past 11 weeks my husband must have heard my need for some relaxation or he might have heard my constant complaints of back, shoulder and neck pain. (Carrying twins for 9 months sure has done a number on my body.) Whatever it was he heard right and did what he could. He gave his valentine an hour massage for Valentine's Day. I'm so excited! My appointment is for tonight and I can't wait. I feel like a kid going to Disneyland for the first time. 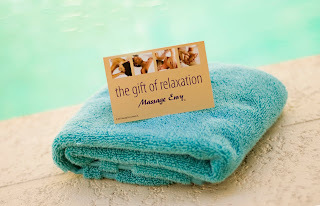 I have had massages before but have never had this desperate need for some relaxation. Being a Mom is hard work. It's the hardest thing I have ever done, but also the most rewarding. So today I'm grateful for an hour of relaxation that won't end abruptly with a baby crying in need.